Drought is one of the serious limiting factor for rice production in rain fed areas. 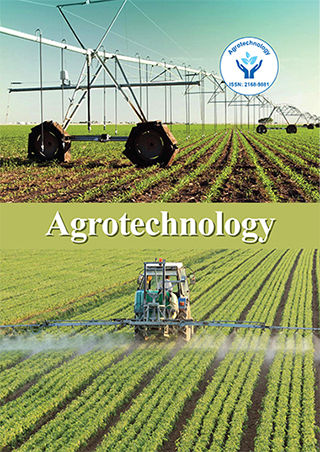 Development of rice varieties tolerant to drought using molecular markers in addition to selection for drought related trait is prioritized in contemporary plant breeding programmes because of its complex nature. A study was under taken to characterize forty three Recombinant Inbred Lines(RILs) derived from drought susceptible IR64 and tolerant lalakananda 41 using thirty four polymorphic Simple Sequence Repeats (SSRs) and drought related traits like leaf rolling, leaf drying, chlorophyll content under stress, drought recovery score. Polymorphic information content ranged from 0.1103 to 0.3692 with a mean of 0.2898 exhibiting low polymorphism as these 43 RILs were developed from the same parentage. Dendogram generated using SSR marker data grouped 36 RILs into cluster I and 7 RILs in cluster II. Lines in cluster II were identified as drought tolerant as they co segregated with yield QTL linked markers under drought viz., RM 520 linked to QTL 3.1, RM 511 linked QTL 12.1,RM 236 linked to QTL 2.1,RM 431 linked to QTL 1.1. These seven RILs showed minimal leaf rolling, leaf drying and high chlorophyll content and drought recovery score indicating that identification of genotypes for drought tolerance using molecular markers coupled with drought related traits would help in precise selection in enhancing yield potential in drought prone areas. M. Girija Rani completed Msc (Ag) in Genetics and Plant Breeding working as scientist (Plant Breeding) at Andhra Pradesh Rice Research Institute and Regional Agricultural Research station, Maruteru, West Godavari district of Acharya N.G. Ranga Agricultural University and pursuing Ph.D from the same university as in service candidate. She has 15 research articles in reputed Journals.